Description: Learn more about China through visuals. Here is a customizable central leadership org chart template provided for free download and print. You can take advantage of this template, to quickly get a head-start when creating your own org charts. Adding and connecting shapes can be done automatically. 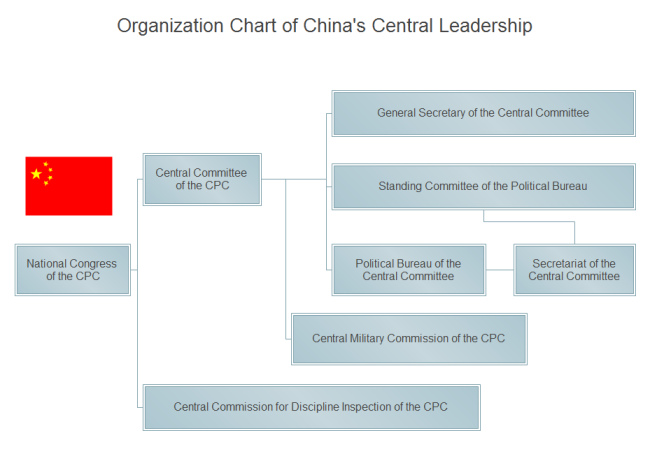 This org chart example about Chinese central leadership is created by Edraw Max, which is available in different formats. Share, discover and update organizational chart templates on a professional template sharing community. All shared organizational chart examples are in vector format, available to edit and customize. Explore whatever fits you best and save for your own use.